Takashi Fukuyama was born in Nagoya, Japan. 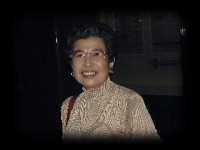 He studied the piano with Kazuko Sato and afterwards with Misuzu Kimura and Masako Tsuzuki. 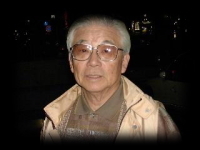 At the Nago9ya College of Music He studied with Kazue Fujii and the late Kiyomi Sakakibara. In 1980 he went to Poland and completed a summer diploma course at the Warsaw Music Academy, now the Frederick Chopin Academy. In 1981 he finished his course at the Nagoya College of Music and recieved his BMus degree. In the same year he made his debut recital in his hometown of Nagoya. After that he went to London to study with the late Antony Lindsay at Trinity College of Music. Whilst at Trinity he was very highly commended in the Chopin Prize and won the Joseph Weingarten Prize. He also won the Hastings Chopin Prize and recieved his ARCM diploma. In England he gave numerous recitals, perhaps the most notable one being at the Holywell Music Room in Oxford, where the Crown Prince of Japan attended. In 1984 he returned to Japan to continue his solo career. In 1985 he married Karen and they formed a piano duo the following year. 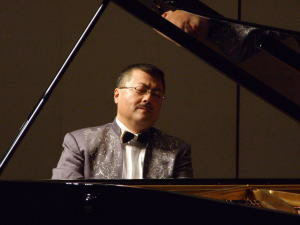 Takashi Matthew continues to give piano recitals in Japan and UK. Karen Fukuyama was born in Bradford, England. She was educated at Victoria Park Preparatory School, Nab Wood Middle School and Nab Wood Grammar School. She studied the piano with Elaine Smith and John Briggs. At Trinity College of Music she studied with Jacob Kaletsky, Ilana Davids and the late Antony Lindsay. In 1983 she recieved her GTCL and LTCL diplomas and went on to complete a further year of post-graduate study. Whilst at Trinity she was highyly commended in the Joseph Weingarten Prize and won the Hastings Chopin Prize. In September 1984 she joined the staff of the London College of Music. In October of the same year she made her debut in her hometown. In 1985 she married Takashi and has lived in Japan since then. She made her debut in jAPAN IN 1986. after gaining her TEFL certificate in teaching English, Karen now divids her time between giving recitals and teaching Engklish to primary schoolchildren in Japan.